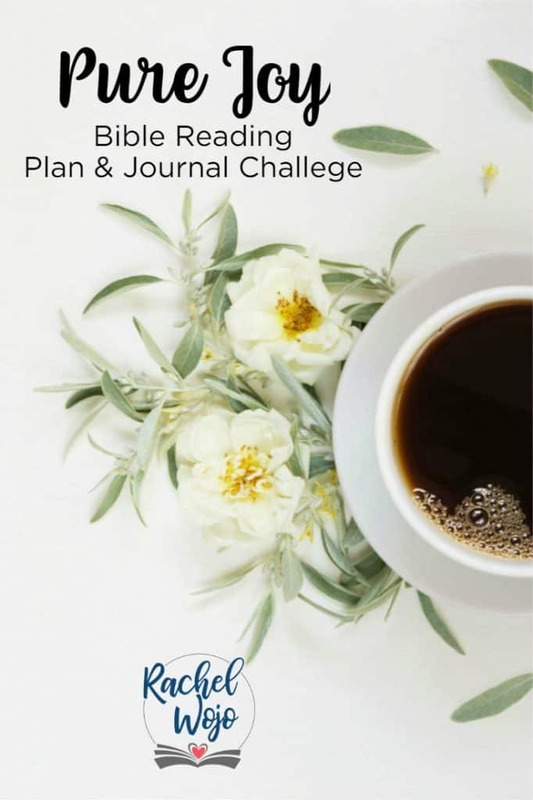 Welcome to the April 2019 Bible reading plan and journal challenge! If this is your first time here, then I’m so glad to have you! Could I ask you to slow down for just a minute as you read this post? God has called me to host the monthly Bible reading challenge and I’ve done so for almost a decade in obedience to Him. After losing our precious Taylor to heaven on January 2, I have been learning how to clasp sorrow and joy together. The next month of cultivating a happy heart will be especially challenging for me and I know there are many of you reading this who feel the same way. It’s time to fill my heart with the reminders that joy is possible because of Jesus. Are you ready to join me for a month of reading what God’s Word says about true, authentic joy that exists in spite of suffering, sorrow and grief? Many readers have requested that I list the journal at the beginning of this monthly announcement post because you already know you want it and don’t need the details. So here you are! This month’s journal is Pure Joy: Cultivating a Happy Heart. 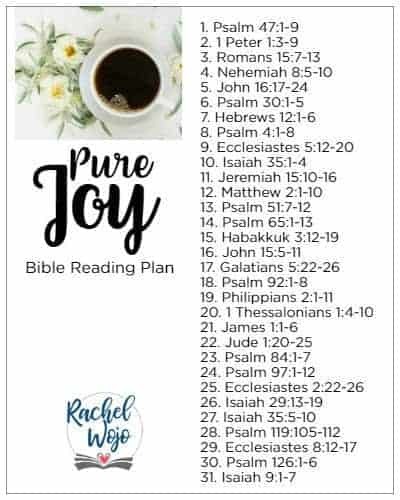 If the enemy is threatening to steal your joy because of your personal circumstances, then this Bible reading plan and journal is for you! Discovering joy for each day isn’t something we can experience only in perfect circumstances. It’s interesting how joy can be found even in hardship. Joy doesn’t depend on the hardness of life; joy depends on the holiness of life. Jesus not only is the Provider of joy; He is our Joy. Joy has nothing to do with location. You can be anywhere at any time. Whether you are in Ohio or Africa doesn’t matter. Whether you live in a tiny hut with dirt floors or a suburban house with polished wood floors doesn’t matter. You don’t have to be in a certain place for joy to flood your soul, because joy is not location-based. 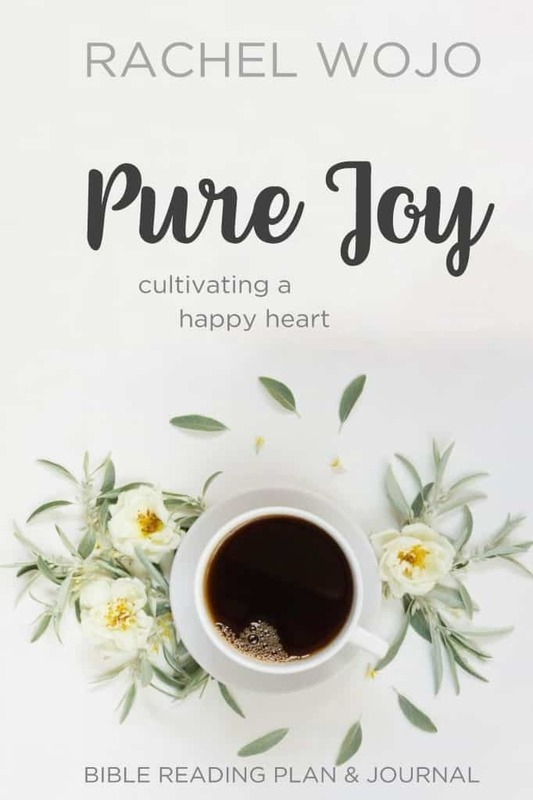 Recommended: Journal your thoughts and prayers using Pure Joy: Bible Reading Plan & Journal.This simple guide will help you stay focused and accountable. It will also leave a legacy for you to enjoy in the future! Ready to begin? I’ll see you April 1st! Don’t forget to order your journal NOW!